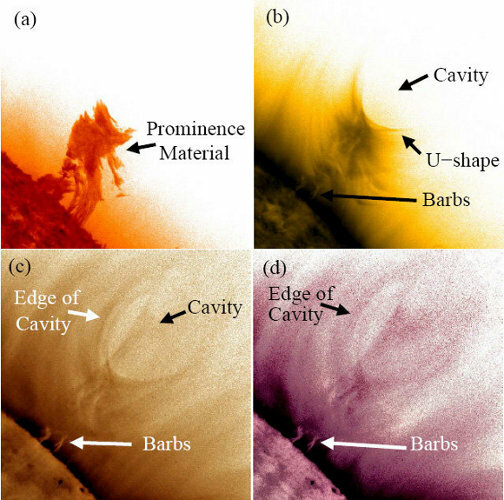 Cavities have been observed above the solar limb for a long time using white-light coronographs (e. g., ). However, study of their structure and dynamical behaviour has only become possible recently with observation from space-based missions such as SoHO, TRACE, STEREO, Hinode and SDO. Here, we use the capabilities of SDO/AIA (, ) to determine the structure and evolution of a polar crown filament within a cavity over a period of 12 hours. The high time cadence, spatial resolution and temperature coverage provide a consistent picture of the filament material and the dynamics of the structure. As most of the material is located in the dips of the cavity, the stability of the structure corresponds to a magnetohydrostatic equilibrium in which the upward magnetic-field curvature balances the gravitational force. The movie below shows the evolution of the cavity in the 171Å channel: (left) from SDO/AIA images, (right) from time slices indicated on the left-hand side images. One can see that a large part of the material within the cavity is falling down to the bottom of the corona and/or the chromosphere during the eruption. Figure 2: (left) Evolution of the cavity during the eruption, (right) time slices at three different locations. The observations of the cavity provided by SDO/AIA are a good example of the need for high spatial and time resolutions combined with a broad temperature coverage. The thermal structure of the cavity suggests that a large amount of the material is located at the bottom of the cavity. The plasma is sustained in an equilibrium state by the upward curvature of the magnetic field which counteracts the gravitational force. The cavity is thus a density depletion at the bottom of which plasma from 50000K to at least 1 million degrees sits. It is important to remember that the observations described above correspond to the projection onto the plane of the sky, and thus do not provide a complete picture of the cavity. In a forthcoming study, we will provide a more complete 3D picture of the cavity and polar crown filament by combining SDO/AIA and STEREO-A/SECCHI/EUVI observations. This aims to investigate how the cavity can be destabilised: by external (i.e. flare, CME) and/or internal (i.e. kink instability, mass loading) triggers. A detailed description of these observations is given in . The SDO/AIA data have been retrieved from the UCLan SDO archive. We thank NASA/SDO and the SDO/AIA science team.